We designed this idea specifically for Plaid! Fall is in the air and in most parts of the country that means leaves are beginning to fall. This time of year is particularly hard for me as I miss my mid-west seasons. I am in sunny Southern California so we don't get too many falling leaves - just palms! Today it looks like drizzle in LA and I could not be more thrilled. The only problem is that I have to do a "big hair" up-do for my 4:00 meeting and I don't want it to fall. I will have to bust out my big can of hair spray or stiffy! Have you heard of stiffy? (not that kind - hehe) Stiffy has been around for ages. You may remember the stiffy bows of the 80's. The big chintz bows that were draped onto baskets. Ringing any bells??? or am I just dating myself. This product is so awesome and deserves a spin into 2010. 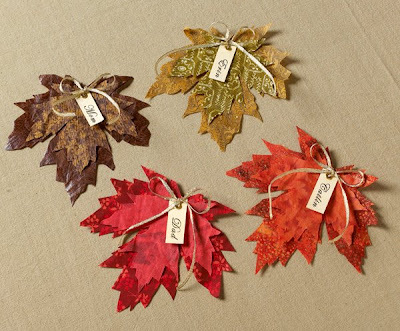 I used stiffy to stiffen the fabric for making the fall leaves that are pictured above. They are easy to make - make one - make a million! 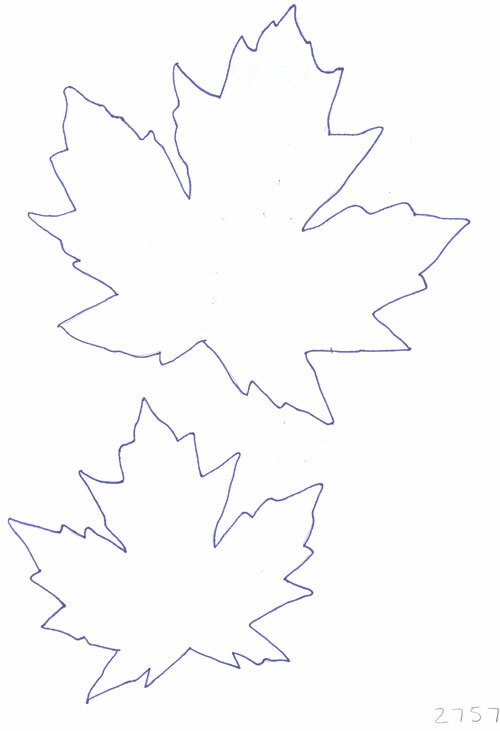 Make this leaf shape with the template below or make your own shape. Last I checked, Stiffy is available at all the major craft and fabric retailers. A little goes a long way and excess can be funneled back into the bottle and reused. Steps:1. Pour the stiffy into a large old bowl and dip the pieces of fabric into the stiffy until they are saturated. Remove the excess stiffy by pressing you're your fingers. Don't wring the pieces! Hang on clip hangers or a clothesline, smooth out the pieces and dry for about 1 hour. 2. Trace around the leaf templates with a pencil onto the dry pieces and cutout. 3. Layer 2 leaves on top of each other and attach with a decorative eyelet. 4. Create a printed-paper nametag by either printing one from a computer or making one with stickers. Attach an eyelet to the top of the tag. 5. Thread the tag and leaves onto a ribbon and tie with a decorative bow. 6. Place one at each place setting. Optional: Leaf ornaments! Skip the nametags and just add a piece of looped ribbon for a hanger. I love this project. I have to make this for Thanksgiving. Thanks. these are fantastic! 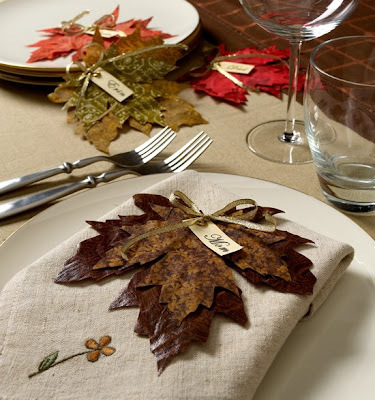 Love the idea for Thanksgiving tabletop! Cute idea! I'd love to take it a step further and make a fall banner for our mantle! Great idea! Do you think that I could run the fabric through my sizzix instead of cutting it with sissors? Yes you can for sure! Just let the Stiffy dry! I would love to see pics. Love, love, love this. And you've got it perfect: Natural tablecloth and placemats. how about place setting for wedding? Can't download the leaf templates. There is no PDF or active link for it! It's a jpeg - so you just click on the picture and download it or save photo. Let me know if you have trouble.